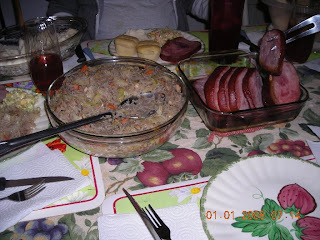 Hubby and I celebrated new year by cooking lots of foods today. It's so lonesome to celebrate new year just the two of us so for a change, we invited some friends from church to come over and have dinner with us tonight. Hubby and I started cooking before lunch and both of us stayed in the kitchen practically half of the day just to cook. We had a division of labor. 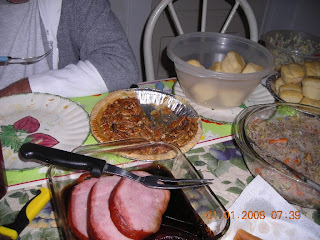 He baked pecan pie, cinnamon swirl cake, prepared green peas salad, cooked mashed potatoes and baked the ham. I cooked pancit, lumpia and I baked apple pie and made pistachio pudding. I cooked last night black eye peas. James came over around 4:00 PM and Bro. 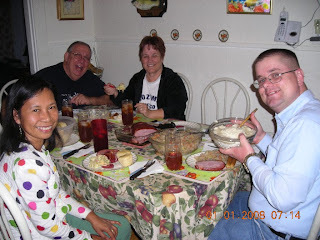 Hugh, our Sunday school teacher and his wife Ms. Mareta came over at 6:00 PM. 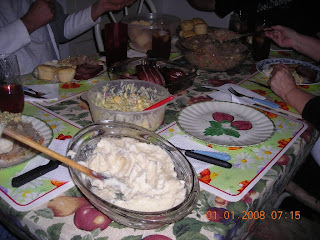 We had a good fellowship and they all said that the foods were great. They were so impressed that we prepared lots of foods. They even had no room for all the desserts after the meal. We shared stories, had a good laugh and good fellowship. Before they went home I asked them to take home some foods because we had lots of leftovers. 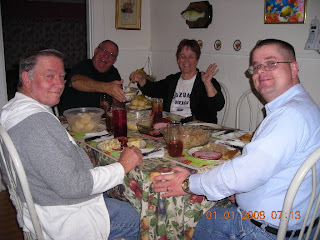 Hubby and I had enjoyed their company and good fellowship with our brothers and sister in Christ. After our friends left, hubby and I said to each other that we are a good cooking team. HAPPY NEW YEAR EVERYONE!!! Ang sasarap ng handa nyo. Happy New Year.